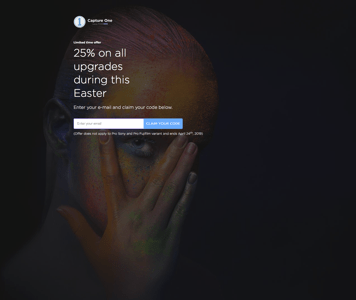 Phase One are offering 25% off the price of the regular upgrades available to existing Capture One Pro license holders. If you’ve been waiting to upgrade to version 12, now is the time. Note that this offer is not available to Pro for Sony or Pro for Fujifilm versions. Simply enter your email here and you’ll receive a one-time code to upgrade. In addition, Phase One are running a similar campaign for Style Kits where by entering your email here you’ll receive a one-time code for 20% off a Style Kit of your choice. Both offers run until April 24, 2019.